One girl's ongoing investigation of the crime fiction genre. If I could move anywhere in the world, I would pack my bags and head to Scandinavia. When I learned of crime writer Will Dean, a former Londoner who did exactly that - moved to rural Sweden with his family - I knew this was an author whose debut novel I had to read. Dean’s forthcoming crime novel DARK PINES is a stylish blend of Nordic atmosphere, small-town life, and dark, chilling crimes - an excellent addition to your winter reading list. Readers of Crime by the Book will know that Nordic crime fiction is above and beyond my favorite, and I was fascinated to see if - and how - Dean’s style of crime fiction set in Scandinavia might differ from the work of the Scandinavian crime writers I know and love. DARK PINES certainly has a style and voice all its own, but Nordic Noir readers will nevertheless feel at home in the dark corners and chilling atmosphere of Dean’s thriller. DARK PINES is a compelling glimpse into small-town life, and a cleverly constructed maze of a thriller. Eyes missing, two bodies lie deep in the forest near a small Swedish town. Tuva Moodyson, a deaf reporter on a small-time local paper, is looking for the story that could make her career. A web of secrets. And an unsolved murder from twenty years ago. Can Tuva outwit the killer before she becomes the final victim? She'd like to think so. But first she must face her demons and venture far into the deep, dark woods if she wants to stand any chance of getting the hell out of small-time Gavrik. Above and beyond the many elements that drew my attention to DARK PINES (the gorgeous cover and compelling plot, to name a couple!) the quality that drew me to this book most of all was the unique background of its author, and the unique “outsider” perspective that he has as a transplant to Scandinavia by way of London. Like Dean himself, the protagonist of this story is also a newcomer to Scandinavia: Tuva, a young female journalist, has come to Sweden to care for her aging mother, and now finds herself essentially alone (her mother is in the hospital), trying to find her own place and make her own mark on the town. I was fascinated by the tensions and challenges Tuva faces in her continued efforts to ingratiate herself with the town’s residents, and loved the idea of following a main character who is as much an outsider to the inner workings of the town as the reader is. As Tuva begins to investigate the brutal murder that launches DARK PINES, she must unravel the various alliances and relationships that tie the town’s social structure together - and in the process, she uncovers dark secrets about this small town and its residents. Adding to the complexity of Tuva’s experience is the fact that she is deaf; I loved that Dean has taken the time to thoughtfully portray this element of Tuva’s life. I have read a lot of crime fiction, and I haven't often seen this diversity of character represented. My reading experience was made all the richer by this added element to Tuva's character. Tuva is complicated without being cliched, and relatable without being stereotypical - she’s about as far from a cookie-cutter main character as you can get, and I mean that in the best possible sense. I enjoyed every moment spent getting to know her, and I wholly admire Dean for taking the time to develop such a unique and authentic main character. After reading DARK PINES, I can only imagine that Dean’s writing is deeply inspired by the natural beauty of the part of Sweden that he himself calls home. True to its title, DARK PINES plays out against the backdrop of a massive, dense forest - and the backdrop to this story turns out to be just as chilling and compelling as the crimes portrayed against it. Dean’s descriptions of this landscape are immersive and engaging, and I found myself hanging on his every word as he described the beauty - and dangers - of this vast forest. The forest itself is, in fact, so central to the story that it begins to feel like a character unto itself. Throughout DARK PINES, Tuva must negotiate her relationship with the forest: she finds herself called back to the forest again and again in pursuit of the truth surrounding the story’s central crime, and yet she is also continuously engaged in an inner battle with her own fears about the unpredictability and volatility of this piece of land. Tuva knows that what she can’t see in the forest can hurt her - and this proves to be even more true than she could ever imagine. My experience reading DARK PINES was wholly an excellent one, but this book really kicked in for me around page 100. Don’t get me wrong: the first 100 pages were absorbing and compelling, but I would encourage readers to have patience - if the first 100 pages seem on the slower side, there is much more to come in this thriller. That something special that makes a read go from “good” to “great” happened for me around page 100, when the story seemed to ratchet up in intensity and pacing. As Dean hits his stride with his debut novel, the reader will find DARK PINES utterly addictive and just plain fun to read. DARK PINES is a slower-burning mystery throughout, but the story becomes increasingly tense with each page that the reader turns, and I found myself glued to the pages as it developed. 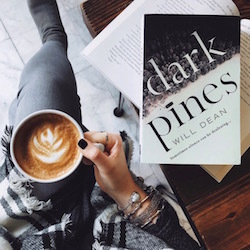 Readers looking for a stylish, immersive, and chilling thriller will love DARK PINES, and debut author Will Dean has proven himself a name to watch in the crime fiction space. I received a free copy of this book from the publisher in exchange for an honest review. This does not affect my opinion of the book or the content of my review. All opinions my own. *Note: DARK PINES is currently slated for release in the UK on 1/4/18 - the below is UK publication information. American readers - you can always find this book on BookDepository, or stay tuned for more information! Dear crime readers: ‘tis the season for another “most anticipated” list! 2019 has already delivered a whole slew of stellar new crime reads, and there is so much more to come as we look towards the summer months. Between May, June, and July 2019, we crime readers will be treated to some of the best the genre has to offer: from new Nordic Noir to page-turning psychological thrillers and dark stories of revenge, there’s a little something for everyone on sale in the coming months! Today’s blog post will be focused on crime fiction releasing from May 2019 through July 2019 -- aka all the crime books you need to take you from spring into summer with a jam-packed TBR list. And not to worry: I will be sharing additional “most anticipated” lists for late summer, fall, and winter 2019 down the road, too! Without further ado, read on for my picks for Most-Anticipated Crime Books Hitting Shelves May - July 2019! It’s hard to believe it, but summer is right around the corner - and it’s bringing with it a whole crop of hugely exciting new crime fiction releases! 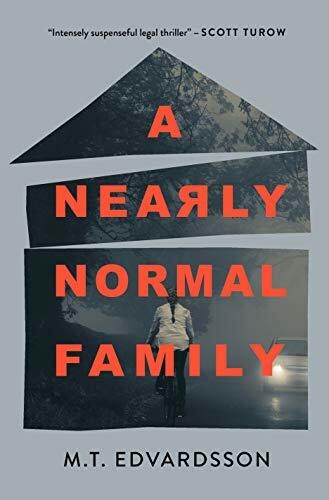 Right at the top of my personal list of most-anticipated Summer 2019 reads is today’s featured title: A NEARLY NORMAL FAMILY by M.T. Edvardsson, releasing in the U.S. June 25th, 2019. This Scandinavian psychological thriller is gathering major buzz; it’s been on my radar for quite a while now, and I’m so excited to finally be digging in to it this weekend. Thanks to the book’s publisher, I’m also thrilled to be able to share with CBTB readers a sneak peek into what’s sure to be one of summer’s hottest crime reads! In today’s blog post, you can get the inside scoop on A NEARLY NORMAL FAMILY, including plot details, advance praise, and an excerpt from the book’s prologue and first chapter. A couple of weeks ago, I found myself in the airport in Oslo, Norway, waiting on a (very) delayed flight back to New York. What could have been a frustrating way to pass an evening was saved by my bookish companion on the trip: Norwegian author Thomas Enger’s thought-provoking standalone crime novel INBORN. Part courtroom drama, part exploration of small-town life in Enger’s native Norway, INBORN is an effortless read--one enhanced by precise plotting and the author’s knack for rich character development. Following a teenage boy who is accused of murder, INBORN moves readers between the courtroom, wherein the boy is being questioned by the prosecution, and the past, where readers slowly but surely unravel the secrets of what really happened on that fateful night. Given that this book did begin as a Young Adult novel, INBORN is lighter on violence and grit than is Enger’s Henning Juul series, but that’s no detriment to the story Enger tells here. Enger has done a superb job adapting this Young Adult crime novel for an adult readership, and readers will find the book’s clean, crisp prose and precise plotting appealingly easy to devour. I come to Thomas Enger’s writing when I want to read a book with characters who feel three-dimensional and endearing, and I found exactly that in his newest standalone. INBORN is a compelling blend of courtroom drama and heart-tugging examination of adolescence--Enger has delivered again. What an absolute thrill it is to be back in Denmark for the annual crime book festival Krimimessen! This exceptional festival is held every year at Fængslet, the Old State Penitentiary in Horsens. Bringing thousands of readers together with authors from Scandinavia and from around the world, Krimimessen is a vibrant and hugely exciting festival for any fan of Nordic Noir and crime fiction as a whole. Scandinavian crime fiction is, naturally, a focus of the festival, but readers are also treated to appearances by some of the biggest names in crime writing from all over the globe at Krimimessen; particular highlights include appearances by Camilla Lackberg, Sara Blaedel, Jussi Adler-Olsen, Clare Mackintosh, Lisa Jewell, Elly Griffiths, and many more! Bonus: the backdrop to this festival - an old prison - simply couldn’t be better for a crime-loving crowd. This will be my second year attending Krimimessen, and I am beyond excited for the crime fiction fun this weekend will have in store! I’m heading on the road from Copenhagen to Horsens later today, and can’t wait to take you along with me for Krimimessen Horsens 2019. I’m thrilled to welcome author Annie Ward to CBTB today to discuss her fantastic new psychological thriller, BEAUTIFUL BAD, which went on sale earlier this month! BEAUTIFUL BAD is a story both intimate and epic, taking readers around the world and into the innermost secrets of a troubled marriage. Told in multiple timelines, BEAUTIFUL BAD looks into the past, tracing the history of married couple Maddie and Ian, and into the future, building to a day known only as “The Day of the Killing,” when this family will be altered forever. Vividly and authentically told, BEAUTIFUL BAD rings true on so many levels, and I was fascinated to learn more about the highly personal inspiration behind this exceptional story—and in this Q&A, you can learn all about it, too. Many thanks to Annie Ward for taking the time to answer my questions, and to her publisher for facilitating this Q&A! Read on for more information about BEAUTIFUL BAD, an excerpt from my review of the book, and my conversation with Annie. Appropriately billed as “Mr. And Mrs. Smith meets Dexter,” Samantha Downing’s deliciously dark debut crime novel MY LOVELY WIFE follows a married couple with a unique way of keeping the spark alive… serial murder. That’s right, this book centers around a pair of ordinary suburban spouses whose date nights involve death. Sound over the top? It is, but in the best possible way. In MY LOVELY WIFE, Downing pushes the domestic suspense novel to its limits—and the result is a hugely entertaining, seriously sinister suspense read. Let’s be clear: this book has a wild, larger-than-life premise - and it’s one that, frankly, could go wrong in less capable hands. But rest assured, Downing gets it very right. MY LOVELY WIFE is wicked fun to read; readers looking for a suspense novel with plenty of entertainment value that doesn’t take itself too seriously will be hooked on Downing’s razor-sharp debut. As for me, it had been a long time since I read a book that was this fun to devour, and I’m already eagerly anticipating what Downing will do next. I just recently read (and reviewed!) Emily Carpenter’s addictive new suspense novel, UNTIL THE DAY I DIE - and today I’m thrilled to welcome her to CBTB to give us the inside scoop on her newest release! UNTIL THE DAY I DIE is a story of psychological suspense, pitting its two female protagonists against conspiracy, betrayal, and even some high-stakes chase scenes. This book is pure “popcorn reading” material: the kind of addictive book you’ll want to devour whole. It’s got entertainment value a plenty, and readers in the market for something cinematic and suspenseful will find UNTIL THE DAY I DIE right up their alley. In today’s blog post, Emily Carpenter gives CBTB readers all the insider intel on her newest release - from details about her story’s two compelling lead characters to her writing routine and a whole lot more. Denmark’s Queen of Crime is back! This past week, Sara Blaedel’s newest book released in the U.S., and I’m absolutely thrilled to welcome her to Crime by the Book today to give us the inside scoop on it! HER FATHER’S SECRET is Book Two in the author’s Family Secrets trilogy - a series that takes a Danish protagonist and brings her out of her native Copenhagen and into the U.S. for a compelling tale of intrigue and interpersonal suspense. Blaedel’s Family Secrets trilogy is a new direction for the author best known for her procedural series featuring Copenhagen-based detective Louise Rick, but it features the author’s trademark endearing characters and research-based writing - a winning combination that has earned Blaedel’s new trilogy fans around the world. I’m thrilled to welcome Sara Blaedel to CBTB today to discuss her newest release, HER FATHER’S SECRET! Huge thanks to Sara for taking the time to answer my questions, and to her publisher for facilitating this Q&A. Read on for more information on HER FATHER’S SECRET, and for my Q&A with Sara! This week marks the publication of the newest book by Sara Blaedel, Denmark’s Queen of Crime, in the US! HER FATHER’S SECRET is the second book in Blaedel’s Family Secrets trilogy, following a Danish woman who moves to the U.S. in pursuit of the truth about her estranged father. Set in Racine, Wisconsin, the Family Secrets books explore exactly what their title suggests: the secrets that can exist between those who should know each other best of all. In HER FATHER’S SECRET, series protagonist Ilka finds herself stuck in the middle of a bizarre - and potentially dangerous - situation. After discovering that her now-deceased father had been receiving threatening notes before his death, Ilka sets out to unveil the blackmailer. And when a series of increasingly sinister events begin to occur in Racine, Ilka has to wonder what she’s gotten herself caught up in… Thanks to Grand Central Publishing, I’m delighted to share with CBTB readers an excerpt from HER FATHER’S SECRET by Sara Blaedel, available this week at your favorite book retailer! Read on for plot details, praise for Sara’s work, and the excerpt.